Thanks to the partnership between the Centre national des arts plastiques (cnap) and Critique d’art, it is possible to shed light on policies supporting art theory and art criticism by offering a platform to one of the winners of the Art Theory and Criticism prize in each issue. Hailing from very varied areas of interest and with very different approaches, the five winners for the year 2014 share in common the fact that they underwrite subjects that have remained on the sidelines of publications and exhibitions in France. Valérie Da Costa proposes a debut monograph on the sculpted œuvre of Pino Pascali, a “comet artist” whose prolific and multi-facetted output challenges such canonical categories as arte povera. Olivier Schefer’s forthcoming book grants a central place to science-fiction as a conceptual and aesthetic matrix of Robert Smithson’s art. Aiming at a work in exhibition form, Marianne Derrien takes a close look at contemporary art by way of the notions of the occult and alchemy, and magic, black and white. The originality of the collaboration between the art critic Christophe Domino and the artist Krzysztof Wodiczko has to do as much with the aim of a World Institute for the Abolition of War in Paris as with the “hypothesis of a political art” today, not forgetting the heuristic interest of the actual relationship of “critical accompaniment” that connects them. Daniele Balit, for his part, broaches the relation between art and public place through the study of the sound installations produced and projected by Max Neuhaus, aimed at the post-industrial urban environment. Well removed from the Futurist desire to subject life to an overall aesthetic principal, Neuhaus’s approach puts the author on the back burner and, through the attention paid to “listening to listening”, deals with the cohabitation of sounds in the city rather than their systematic organization. It is in this sense that the concept of “ecological music” assumes its full breadth. This subtly contextualized case study reminds us of the importance of a history at the crossroads of several paths, beyond disciplinary boundaries. 5 The work is held at the Peggy Guggenheim Foundation in Venice. 1Silence is static whereas sounds, noises and smells are dynamic. It was Carlo Carrà who declared as much, in 1913, reckoning that the moment had come for painting, that art of silence, to leave its hieratic space and launch itself into the conquest of modern society’s speeded-up space/time-frames.1 The pictorial languages must henceforth be capable of expressing a “plastic equivalent” of the variety of sensory stimulations offered by the modern city, with its “theatres, music-halls, cinemas, brothels, harbours, garages, hospitals and industries”.2 A picture such as Dinamismo di un’automobile by Luigi Russolo (1912-13) captures a vehicle passing at full speed—nothing less than a revelatory experience for the Futurists, capable, in a split second, of doing away with an age-old tradition of aesthetic values, from the Nike or Winged Victoryof Samothrace (see the famous words of Filippo Tommaso Marinetti) to the musical harmonies of the Pastoral and Eroica symphonies.3 If the succession of angles dominating the stage seems to correspond to the “shock of acute angles”, those “Angles of the will” inventoried by Carrà among Futurist tools of representation, it also very well illustrates the physical phenomenon of sound propagation. The gradual approach of the sound waves seems, in particular, to reproduce the frequency variation of the Doppler effect, a phenomenon of perceptive alteration produced by the movement of the sound source, experiencing which is quite common in towns and cities, when, for example, emergency vehicles pass with their sirens blaring. 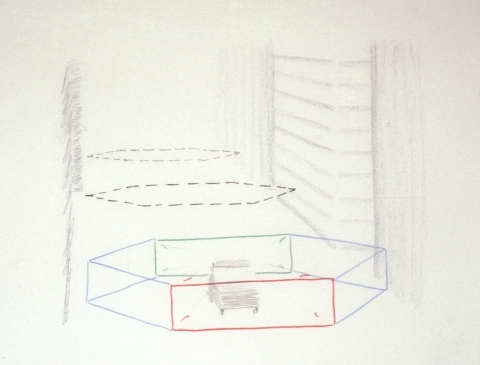 As is specified by the repertory of sound effects drawn up by Jean-François Augoyard and Henry Torgue, in the Doppler effect, rather than the sound source, “it is the relation between the observer and the emitting object which is altered”. 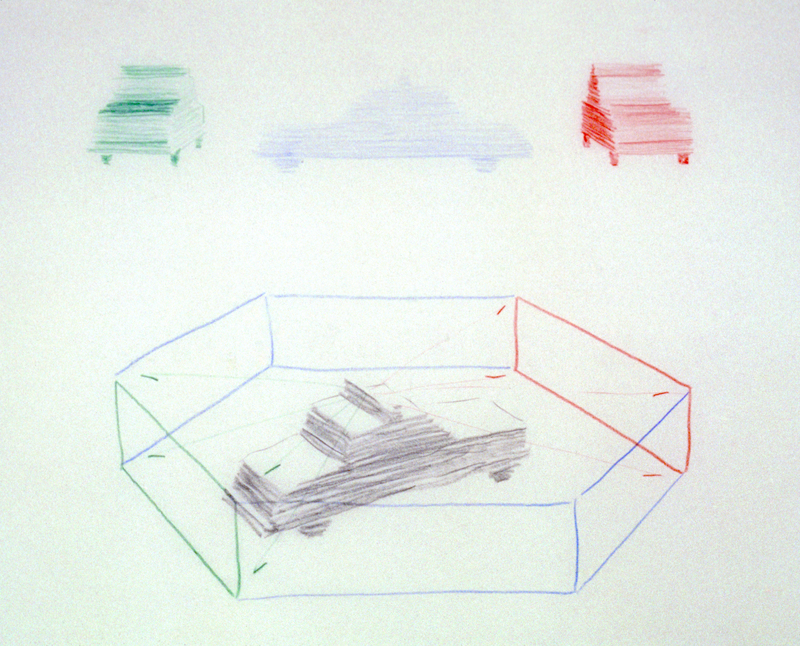 What is involved is a “relative anamorphosis of the original signal”. Because the effect—the authors explain—“does not just point to the necessary cause which, in the end, turns out to underpin its existence, it is still the trace of an event [...]. [The effect refers] to all the conditions surrounding the existence of the object and to the way it appears in such a situation. The perceptible “effect” is, from this viewpoint, immediately linked to a circumstantial cause”.4 Seen from this angle, a painting like Giacomo Balla’s Velocità astratta + rumore (1913-14) (the central part of a triptych depicting the three temporal states of an approaching car, which then passes, and drives away) also evokes this phenomenology of the traces of events which Augoyard and Torgue talk about.5 Balla’s transcription is presented like a constellation of forms representing the moment of greatest intensity of the acoustic energy, and its dispersal in many different centres and directions. The poetics of the Futurist sensation thus extracts the phenomenon from the simple relation of causality, and re-places it at the heart of its circumstantial causes. In this way, it constitutes a significant precedent with phenomenological approaches to the sound dimension which will carry on experimenting with their plastic possibilites. 2Half a century later, Max Neuhaus produced his project Listen, nothing less than a listener’s manifesto, organized from 1966 on in different formats: lecture, newspaper article, post card, self-adhesive sticker, poster, as well as sound walks in New York neighbourhoods. This pivotal work in the artist’s career, somewhere between musical field and artistic field, carries on the conquest of the “infinite variety of noise-sounds” declaimed by Luigi Russolo in his famous manifesto, not without inheriting his fascination with the industrial city and its infrastructures. If one of the stages of the walk is dedicated to listening to the sounds of an electric power station, the one that leads the group of participants to park under the Brooklyn Bridge once again involves passing vehicles, this time perceived as a flow of sound released by the traffic, magnified by the bridge’s vibrating energy. However, even though there is a continuity between Russolo’s “modern ear” and the choreographed listening of Listen, the historical transition between the two periods is not made without breaks. We must not in fact forget that the urban territory of New York occupied by Listen was that of a city subjected to a major process of de-industrialization caused by the crisis of the 1960s and 1970s. That change in the landscape of modernity represented a crucial resource for the artistic community of downtown Manhattan, which made it an object of experimentation and conquest (starting with the conversion of abandoned premises into lofts and exhibition spaces). On the other hand, some of its leading figures definitely dealt with the implications of all this. As Gordon Matta-Clark emphasized: “[...] the availability of empty and neglected structures was a prime textural reminder of the ongoing fallacy of renewal through modernization”.6 Like Gordon Matta-Clark, and Richard Serra, Max Neuhaus is among those artists who, through their contextual explorations, have confronted a “left over public space” gaining ground in New York’s neighbourhoods, with all the ambivalence that that implied, somewhere between degradation and freedom of experimentation.7 “The omnipresence of emptiness, of abandoned housing and imminent demolition gave me the freedom to experiment with the multiple alternatives to one’s life in a box as well as popular attitudes about the need for enclosure”.8 Listening to the modern city is in this sense less linked to a process of de-contextualization and representation of the acoustic environment than to an attempt to question and play a direct part in the heterogeneity of a territory undergoing changes, together with its conflictual and problematic aspects. 12 According to the text belonging to the drawing Fan Music of 1993. 5Not only were the sites chosen to construct the acoustic environments more exposed to the antagonisms and complexity of the city’s social fabric—be it a particularly neglected place as in the case of Walk Through, or an extremely dense one in the case of Times Square--, but those installations also entail a form of hitherto unused time-frame, extending it to cycles spanning several months, and even to the state of a permanent sound work. 19 Joseph, Branden W. “An Implication of an Implication”, Max Neuhaus : Times Square… op. cit., p. 60. 20 Neuhaus, Max. “Sirens”, (2003), republished on http://www.max-neuhaus.info/bibliography. 22 Neuhaus, Max. “Sirens”, Op. cit. 8The series of drawings produced in 1991 to illustrate the project helps us to observe a way of representing the sonic phenomenon of the passage of vehicles which differs from the above-mentioned Futurist works. Although the chromatic choices are not as harsh (the three principal colours, red, green and blue, being in fact the same as those used by Balla), the “angles of will” and the jolts of acoustic energy of Russolo and Balla gave way to much more defined forms: geometric sonic volumes drawn with pencil, as well as arrows indicating the directions of diffusion. 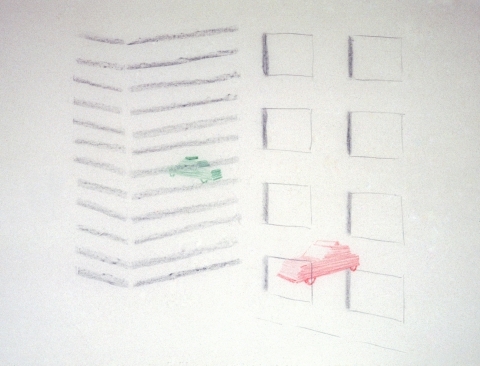 Likewise, the distances between the sound waves of the Doppler effect represented by Luigi Russolo became, in Max Neuhaus’s drawings, much more clearly defined and regular: we can recognize a series of sonic events set at a distance and interspersed with silences, corresponding to a sonic design aimed at better locating the sounds of the sirens. “I was able to give cars a sonic form”, he declared.22 Be it on the social level (that of sonic design) or the aesthetic one (in situ installations), that shift from the representation of the phenomenon to its making responded to a desire to act on the environment. A form of involvement which, in listening practices, put the stress on the role of the subject, and turned the notion of soundscape into an issue of social construction.23 Accordingly, this poetics of space in Max Neuhaus’s work was also a politics of space, because the need to control the sound, and “give shape” to it, rather than predetermining the listening, left him free to forge his experience of it, beyond any imposition. There is no such thing as intrinsically bad sound—as Max Neuhaus was at pains to point out during his lectures around Sirens. Just like an “ecology of sound”, art was thenceforth practiced through a form of “attention to the sounds that we add to the environment”.24 It is a matter, above all, of learning how to listen; or rather of listening to listening. 6 Matta-Clark, Gordon. Moure, Gloria. Gordon Matta-Clark: Works and Collected Writings, Barcelona : Polı́grafa, 2006, p. 141. 11 Before producing Water Whistle,Max Neuhaus spent a long period on a ship to study underwater sounds. 21 However, despite the availability shown by the police institution, Max Neuhaus would not manage to industrialize his system. 23 On this idea see: Thompson, Emily. The Soundscape of Modernity. Cambridge, Mass. : The MIT Press, 2004.